three weeks ago I've installed macOS High Sierra on my MacBook Pro 13" (Early 2015). 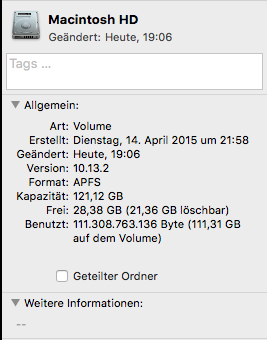 I've an internal SSD with about 120 GB (Apple Logic) disk space. Before the update I had about 30 GB of space lost. But after the update it seems that some of the disk space is "lost" or got filled with some random crap. 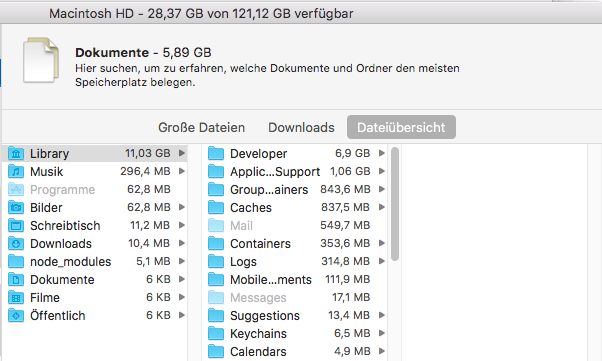 As you can see the overview tells me, that there are about 28.38 GB free space with the information, that 21.36 GB can be deleted. So my first question is what can be deleted? After some googling I found out, that these are files that were not really needed because they can be downloaded or found somewhere in the cloud. But at the moment it's not clear to me which files are really meant. I first recognized the problem when I wanted to download the latest version of Xcode and the AppStore.app told me that there is not enough disk space and I've to clean up my disk. As you also can see, the app shows me that the system requires about 88.14 GB disk space, which cuts me really off. For what is this disk space needed? The most space is taken by all the developer tools. My personal data like images, etc. were stored on a SD card. So my question is, how can I get my disk space back and why is the system using so much space? I created a few of those (10GB each and some larger - 30 GB) until the SSD was nearly 100% full. Finally: df -h / now reports the correct allocation with one oddity: ifree read 9223372036854041010 which seems incorrect. Disk Utility (First Aid) was not picking up any issue although the reported available space was clearly off by 50 GB (almost 50% of the entire capacity of my SSD partition). The first step in disk space questions is to power down the mac and then restart to another OS (bootable installer, internet recovery, recovery HD) and run Disk Utility. This verifies that the accounting is correct and you have good foundation to then remeasure and then take action. In your case - the snapshots don't take any substantial space since that is all added up in the white diagonal line shaded part. A small fraction and you can get that exact value hovering your mouse over it just to the left of the white space on the right. Next - system allocation in yellow covers all the user data for other users on the Mac - you might need to log in to each user one by one to pick apart how much space each user's home folder takes or resort to a tool like DaisyDisk to really read as an administrator how much space is in each home folder. Apple's tools work well in many situations, but yours not so much. You did all the things proper in looking at app sizes, user data, etc..
Then start taking note of which folders on the computer are large and diving in to them. Or get a third party tool. I have same problem. I would get the app DaisyDisk and run it on your Mac. It displays an image map of your disk drive and makes it very easy to spot which folders/fines are taking up so much space. I ran it and found out my system folder was only 9 GB, not 89. The app is available from the app store for $9.99. If you go to their website, here they have a free trial app. There is a similar app, GrandPerspective, which is free. Not the answer you're looking for? Browse other questions tagged time-machine ssd high-sierra disk-space . My available disk space does not make sense. Why?